Just south of London lies a modest country house, once the childhood home of King Henry VIII. Eltham Palace has recently become renowned for its beautiful Art Deco interiors, it’s halls still ringing with ghosts of extravagant dinner parties hosted throughout the 1930s. It’s history however, has not always been so glamorous. The first recorded sign of Eltham Palace is found in the Doomsday Book of 1086, listing it as Eltham Manor, belonging to William the Conquerors half brother, Odo. The house changed hands many times over the next few centuries, with owners gradually adding to the architecture of the estate. By the 14th Century, Eltham Palace was one of King Edward III’s royal palaces. The palace was surrounded by a moat, complete with drawbridge and high walls. Stained Glass Windows in the Great Hall; a Throwback to Tudor times. The children of Henry VII were brought up at Eltham, which served as a Royal Nursery for future monarchs and royals, including Henry VIII. Henry VIII however preferred Hampton Court, and started building and decorating there instead of Eltham, whilst Greenwich Palace served as his London Palace, being closer to Westminster and more easily accessible. Throughout the Civil War (1648) Eltham was used as a base for Cromwell’s troops, and subsequently fell into disrepair. By the turn of the 19th century the once regal palace was reduced to a farmstead, the Great Hall now a barn, the palace in ruins. Stephen and Virginia Courtauld discovered the dilapidated Eltham Palace in 1933, and set about restoring it to glory. Having hired architects Seely and Paget to rebuild the estate they looked to Christopher Wren’s work for inspiration and decided on a brick and Clipsham stone exterior. The development was haulted by a battle with the Society of Antiquaries who were concerned with the loss of areas of historical interest. Once this had been pacified, and reassurances had been sought that several features, including the 15th century timber gables in the great Hall would be preserved, building work began. Eltham Palace was a haven of modern technology; electricity powered many internal systems including the clocks, servants bells, lighting, they even had their own internal telephone exchange. Eltham also boasted a centralised vacuum cleaning system, only seen to this day in larger houses. It’s mechanism can be seen in the basement. During the Second World War Eltham suffered badly; in 1940, during the Battle of Britain 4 bombs landed on the great Hall causing extensive damage, a further 100 bombs fell within the grounds. A year later a parachute mine damaged the great Hall again, and in 1944 a flying bomb severely damaged the greenhouses. Stephen Courtauld, an avid orchid collector, had thankfully evacuated his previous plants in 1939. Throughout the war the basement was turned into a dormitory, and the family welcomed anyone who needed shelter, having invited her relatives initially Ginie opened her house to those in need. The war however left the Courtaulds scarred, and they eventually decided to move to their Scotland estate on Loch Etive in Argyll. In its time, before the devastating effects of the War, Eltham was seen as the Gatsby mansion of London. Ginie enjoyed throwing lavish parties, as well as small dinner parties for selected few. Stephen designed cocktails for every occasion and they flourished as the elegant, affluent hosts. The great Hall frequently housed chamber orchestras, bands and singers whilst guests danced the night away in perfect luxury. Upon arriving at Eltham you’re provided with an audio guide that takes you on a guided tour of the house and gardens, complete with interactive multimedia it gives you a sense of what the house would have been like in the 1930s. You can meet the family, and the beautiful lemur, experience the parties, even listen to some of the guests accounts! There are special tours for children to enjoy, as well as activity packs for them to work through and a play area too. On site there’s a lovely cafe and beautiful gardens for everyone to enjoy, and just a short bus ride from Greenwich it’s easy to get to from central London too! Bristling with Tudor history and Art Deco architecture it’s the perfect day out for everyone! Arriving in Sofia, it is immediately recognisable as a city with a communist past. Concrete flat blocks rise up before you, and every street boasts Stalinist architecture all along its length. Walking through Sofia however, there are no statues of Lenin, or red stars visible, having been ripped down in 1990 when the Communist state fell. Having decided to take a 4 hour walking tour exploring the Communist history of the city it was clear that even today opinions vary hugely across the population. Bulgaria’s military history during the Second World War is a fascinating one, with their allegiance changing multiple times over the course of the war, including a period when they were technically at war with every other fighting country in Europe. By the end of the war they had sided with the Red Army. Thus began their communist era. Championed by Georgi Dimitrov, The Bulgarian Communist Party took power in 1946. Bulgaria then became known as People’s Republic of Bulgaria, a title which would remain until 1990. Before the war Bulgaria, had been known as the Kingdom of Bulgaria. Their rise to power was preceded by a bloody assault on the monarchy. On 1st February 1945 the Regent Prince Kiril, along with hundred of officials who had been prominent in pre-communist Bulgaria, including an ex Prime Minister were accused of war crimes, and around a quarter were subsequently executed 4 months later. During its early years The Bulgarian Communist Party began to outlaw religions. Whilst not explicitly legislating against citizens rights to practice religions they used scare tactics. Churches, Mosques, Synagogues and Temples were hidden away by new buildings, purposefully built around them to mask the existence of sacred buildings. Members of the police, or uniformed members of the party would hover outside said buildings at the times of services, observing those attending religious ceremonies, never acting with hostile intentions, but instead scaring members of the congregation until few people attended organised religious services. The paranoia still exists today; when we visited The Church of St George (a beautiful redbrick rotunda) I took a photo of the exterior and a lady going to a service asked to check my photo to ensure her face wasn’t in the picture. When Dimitrov passed away in 1949 Vulko Chervenkov suceeded him as leader of the Bulgarian Communist Party, whilst not popular within Bulgaria, his main supporter, Stalin had enough influence to allow him to maintain his position for 6 years. After Stalin’s death in 1953 Chervenkov only survived a year before he was replaced by Todor Zhivkov. He stayed on as Prime Minister for another 2 years before Anton Yugov took that position from him too. Todor Zhivkov had a notably long stay as head of the Bulgarian Communist Party, leading it for 33 years, and in 1962 he also took up the position of Prime Minister, he monopolised control of Bulgaria. One of the biggest controversies of his rule came in the form of the infamous murder of Georgi Markov, a previous friend of Zhivkov, who had been exiled to London following publication of anti-communist works. Markov was murdered in London after a member of the KGB used an umbrella to stab him with a ricin infused pellet on Zhivkov’s birthday in September 1978. The Communist government of the Bulgarian people was based near Serdika (now a fantastic site to find Roman ruins) and the party headquarters were adorned with the large red star seen below. This was rumoured to have been made of rubies, however when it was torn down at the end of the Communist era it was found to only be coloured glass. Originally the 12ft statue of Lenin was erected far across the Piazza surveying his Communist Head Quarters, now however this has been replaced by a statue of Saint Sofia. Both the star and the statue can be found at the Museum of Socialist Art which is a little way out of the city center but definitely worth a visit! By January 15th 1990 the Communist Party was officially no more. It was the end of an era of governing that had cost between 50,000-100,000 lives. Zhivkov’s daughter, Lyudmila Zhivkova, had been responsible for the start of social liberalization in the country and was a force for cultural freedom until her suspicious death in 1981. By Mikhail Gorbachev’s election as President of the Supreme Soviet Union in 1985, the USSR and the Communist movement were losing momentum. In June 1990 Bulgaria held its first multi-party elections in 51 years, The Republic of Bulgaria was born, and the Bulgarian flag no longer included the Communist emblem. The Communist reign in Bulgaria was over. The 21st of February, as most days are, has proven to be an instrumental historical date across many eras of History; Alan Rickman was born, Silent Witness aired, Rosalind Franklin and some men (who took all the credit) discovered the double helical structure of DNA, and the Battle of Verdun, which claimed a million lives, started. Whilst searching for historical events that occurred on 21st Feb, I discovered that one of my favourite political texts was published on this day. The Communist Manifesto, written by Karl Marx and Friederich Engels, was published 21st Feb 1848. Originally published in German, The Communist Manifesto was commissioned by The Communist League and has been declared the most influencial text of the 19th century; Move over Jane Austen. As many of you know, or will know when next week’s blog on Communist Sofia comes out, communist and socialist history is an area of great interest for me! It fascinates me that since the publication of The Communist Manifesto, despite so many countries and leaders trying to implement communism the world has, as yet, failed to successfully produce a communist state. In every attempt there are enough greedy, as Marx and Engels would call them, Bourgeouis refusing to relinquish their wealth and preventing the system taking full effect. The manifesto was published far ahead of its time. If we think back to the great Socialist states of Europe and the world we probably think of Mao, Stalin and Lenin first. Their ascent to leadership wouldn’t come about until around 100 years later, although the Manifesto certainly paved the way. After an enjoyable few months of blogging, I’m looking forward to what this next year will bring! My S/O has planned a birthday trip to Dover Castle for us both, English Heritage opening hours are getting longer, and later this week I’m off to explore historic Oxford, notably the Degas to Picasso exhibition! So watch this space, there’s a blog in the pipeline for all the awesome historical birthday presents I got this year! Our final day in Oslo had finally arrived. With a flight in the evening we decided to save the Armed Forces Museum till last as it was one we were both interested in, we wanted lost of time there, and it’s free! Housed within the grounds of Akershus Fortress, the museum is huge! Outside cannons, tanks and ambulances greet you as you arrive. The ambulance, it turns out came from the UK, and was on loan for their temporary exhibition on the medical corps. The museum takes you through military history in Norway, from the Vikings through to modern day conflicts and WWII. The first room focuses on modern conflicts, and Norway’s involvement in Afghanistan, and work with the UN. Upstairs the rooms are filled with cannons, and models of castles from around Denmark-Norway, as the pairing was then called. Christiania (now Oslo) was the Norwegian capital, whilst Copenhagen was the capitol of the whole country. The models also include castles such as Kastellet, found in Copenhagen on a star shaped island. Medieval weapons, defenses and uniforms are displayed, however some rooms do not have English translations, but have QRS codes which unfortunately don’t work. This room was full of military uniforms, with rank slides and honours which are still a total mystery to us, which was a shame as it was something we were both interested in! Returning downstairs there is a very detailed exhibition on how WWII started, and how Norway became involved with the fight. The Resistance Museum had more information on Norwegian citizens and their actions throughout the war. Having been a neutral state from 1814 to 1940 they only had a 20,000 strong army to defend against the German Army. The Norwegians had been keen to stay out of the fighting across Europe they were not prepared for the advancing German Forces. Had they started recruiting forces earlier they could have increased their forces to 120,000 people. 50,000 Norwegian Men were said to be fighting for Norway during 1940, compared to Germany’s 4.5 million. The final permanent room looked into modern conflicts with the UN, the Cold War, including a mini bunker, the Navy, and ground forces in Afghanistan. The final room of the museum was an exhibition on Military Medicine. The exhibition housed various pieces of quintessential pieces of medical equipment such as first aid kits, stretchers and technology developed for the military. Horse drawn ambulances from the first world war, along with modern ambulances used in combat were displayed here. Tearing ourselves away from the museum, we headed to Hard Rock Cafe for our final time (they have an awesome lunch deal). Our planned afternoon of souvenir shopping was rather disrupted by Spencers/Portico deciding whilst we were thousands of miles away was time to try and sort our broken heating (After we’d waited 6 months for them to get their act together). A delicious lunch later, we headed to the airport. In 2014 a redevelopment of Oslo Airport was announced. Designed by Gudmund Stokke, under architectural firm Aviaplan. The new departure hall is beautiful! The building is light, airy, with golden fairy lights draped around every pillar. The whole building is clean and very Scandanavian, even the security staff are lovely, when you forget to take your 1l water bottle out of your hand luggage! After a lovely but exhausting week, it was time to head back to London. Even staying for 5 days I felt there were things I could go back to do/see. I’ll definitely be back! Probably in summer…and when I actually have money! Day 4 in Oslo was our final day with our Oslo Passes, and we each decided to go to museums of personal interest. I started my day visiting the Jewish Museum. Jewish history throughout Europe is an area I find fascinating! Each city I go to I visit the Jewish museum, and discover such a varied history and experience each native Jewish people have lived through. Norway is not widely known for its involvement in WWII, however it suffered a huge loss of Jewish citizens during the war; of over 2,000 Jews living in Norway before the war, only 25 survived. During the war, countless children and families were saved by the Carl Fredriksen Transport Project. A group of rebels saved families by transporting them to Sweden, hidden in trucks, under covers, the children often sedated to keep them calm. Named after the Norwegian King Haakon VII (who’s birth name was Christian Frederik Carl Georg Valdemar Axel) the operation transported over 1,000 refugees to Sweden. Although a small museum, there is plenty to do; the bathroom is certainly worth a visit, all around the walls are stories or jokes, in Norwegian, English and Hebrew, left as momentos. The building is quite hard to find, hidden away behind gates, you have to be buzzed in, but it houses a fascinating history. The museum was originally a synagogue, however after the war it became a Muslim school, and eventually a Gay Bar! The Museum of Architecture and the Museum of Contemporary Art lie next to one another geographically and are part of the National Galley collections which will soon be housed together in a single building. The Museum of Contemporary art is one of the larger museums in Oslo, and spread over 2 floors. Downstairs was a temporary exhibition by Sidsel Paaske; “On the Verge”. Upstairs houses the permanent exhibitions of Louise Bourgeois and an environmental exhibition spanning most of the upper floor with interactive rooms where you can make model jelly fish, watch films and learn about conservation projects around the world. The museum’s interior is beautiful, with golden gilt additions to ceilings and gorgeous arches its architecture itself is worth seeing. Just across the road from the Museum of Contemporary Art lies The National Museum – Architecture. Housed in the old National Bank Building, and redecorated by architect Sverre Fehn the Architecture Museum contains 1 permanent exhibition and 2 temporary exhibitions at any given time. The permanent exhibition focuses on architecture in Norway and major projects managed by Norwegian architects, such as their Opera House, designed by Snohetta . The smaller exhibition, housed in the vault of the old bank focussed on the bank robberies carried out by Ole Hoiland in 1835, which led to his imprisonment in Akershus Fortress (and his subsequent 11 successful escape attempts). The final exhibition, “Baking Bad” exhibited works from an annual gingerbread baking competition for school children. They were utterly fabulous!! The photo (left) shows one of the winning entries, a gingerbread model of the house from “Up”. All the entries were inspired by TV or films and ranged from recreations of King Kong hanging from the Empire State Building, to Hagrid’s cabins to Walter White’s infamous meth lab. In the corner was a small station where you could build your own mini sculpture. The National Gallery lies about a 15 minute walk from the Architecture and Contemporary Art museums. Admittedly our main purpose of visiting the museum was to see Munch’s Scream, following the disappointing lack of Scream at the Munch Museum. Thankfully it was no Mona Lisa moment and the painting was large, and uncrowded. Our favorite paintings however were by Norwegian painters Christian Krohg and Harald Sohlberg. Our final stop for the day was the Reptile Park; definitely one of our favorites. I’ve always loved snakes, as a child most of my birthday parties were animal parties, concluding with a boa constrictor using all the guests stomachs as a transport medium. It was even the highlight of my 18th birthday party, and the snake deciding my little brother looked like a yummy dinner, and beginning to entwine itself around him only made it more entertaining. Admittedly the Planet Earth 2 Iguana vs Snake scene made me more wary, but getting to hold a snake was a definite highlight! If you come at the right time you can see the animals be ing fed, and sometimes hold some of them. Even if you arrive too late for this the animals really wake up afterwards! One of the snakes was on a mission to escape, which he kept doing for about half an hour, trying to fit through the small gap in the glass (it was about 1cm wide, no way he could get out). The marmosets are very friendly, and will come up to the glass and interact with you, even start talking to you too! They live in an enclosure with a beautiful golden dragon. I may have spent a lot of time befriending the monkeys! Our evening ended up in Hard Rock Cafe, again. Seriously Oslo, vegetarian food needs to be a thing! Our third day in Oslo marked our excursion out of the city center and to Bygdoy on the other side of the quay. This area houses all the museums related to Norway’s seafaring past. The Oslo pass includes free travel within zones 1 and 2, which includes Bygdoy. A door to door bus ran from just outside Anker Hostel, taking around 30 minutes to get us from A to B. The Viking Ship Museum houses 3 restored Viking Ships, as well as the items found within various Viking Burial sites unearthed by archaeologist Gabriel Gustafson. The ships are beautiful and striking, and housed within what appears to be an old church, any noise echoes throughout the whole building; it creates a peaceful atmosphere. The three ships (Gokstad, Oseburg and Tune) each represent an important aspect of Viking archaeology; Tune was the first viking ship ever to be excavated whole in just two weeks, the dig headed by Oluf Rygh. Oseburg was used as a burial ship for 2 noble women in the 9th Century, and its excavation provided crucial information into Viking Death. Filled with weapons, clothes, shoes, carved animal heads, and several animals. Gokstad was also used as a burial ship for a young man killed in battle. His grave contained 12 horses, 8 dogs, 3 small boats, ornate game boards and 2 peacocks. Although a small museum it is definitely worth a visit, particularly if you’re interested in history or archaeology! The Folk Museum lies about a 10 minute walk down the road from the Viking Ship Museum. It was by far the largest museum we had visited! The interior museum was split over 2 floors and 2 building, taking visitors on a long journey through a history of crafts, furniture, weapons and Christmas. The majority of the museum is outside, so make sure to bring lots of layers, it can be quite biting! The outside portion of the museum houses an imitation of a traditional Norwegian village, with thatched outhouses, some open to the public to show an example of guest houses, kitchens, stables and living rooms. Also within the grounds are a beautiful wooden church (pictured right), and a large house showing the living standards of Norwegians from the 60-90s in the form of model flats. A short way down the road 3 museums exist on the same lot; The Kon-Tiki Museum, Maritime Museum and the Fram Polar Expedition museum. Unfortunately when we went to visit the Maritime Museum was closed. The Kon-Tiki Museum was Emily’s favorite! It followed the 2 expeditions of Norwegian explorer Thor Heyerdahl (1914-2002) and his voyage across the sea on the Kon-Tiki balsalwood raft (pictured right), and his subsequent trips on Ra and Tigris, boats formed from reeds, based on an Egyptian design. For a man with a phobia of open water, he spent an awful lot of time sailing the oceans on vessels scientists promised would not be seaworthy. The museum houses both Kon-Tiki and Tigris, and also has model Easter Island caves, and shows the Oscar winning Kon-Tiki documentary. For a relatively small museum there is plenty to do! Our final stop for the day was the Fram Polar Expedition Museum. Billed as the ‘Best Museum in Norway’ we left it till last so we could spend as long as we wanted there. Like Moulin Rouge, we discovered it was grossly oversold. I’m sure if you’re doing a PhD in Polar Expeditions it would be highly engrossing, but given neither of has a particularly deep interest the pages and pages of 20pt type wasn’t particularly gripping. Positives now though! The museum is gigantic, and housed across two buildings, the main attraction in each is a huge polar expedition ship. The larger ship, Fram can be boarded, and a small number of the rooms / cabins / galleys explored. Every 20 minutes, from the deck of Fram a Northern Lights show can be watched, projected onto the white roof of the museum, and a sail, fashioned into a screen. Visitors can also try out the arctic simulator room, which exposes you to sub zero temperatures. I’m sure in summer this is more enjoyable than winter, when outside temperatures were around -3 degrees to begin with, tho it’s novel none-the-less. Our favorite part of the museum was the kids section, where you could try and navigate using only the stars, and a fake duck shooting range to try your arm at shooting. The gift shop here is vast, and fairly reasonably priced, a perfect place to pick up your last minute souvenirs, postcards and trinkets. After a pretty decent nights sleep (we were out like lights at 10pm) and despite a rather noisy dorm mate, woke up refreshed and ready for our 8am start. Having bought an Oslo 72 hour pass (£50 for students) we were keen to visit as many museums as possible. 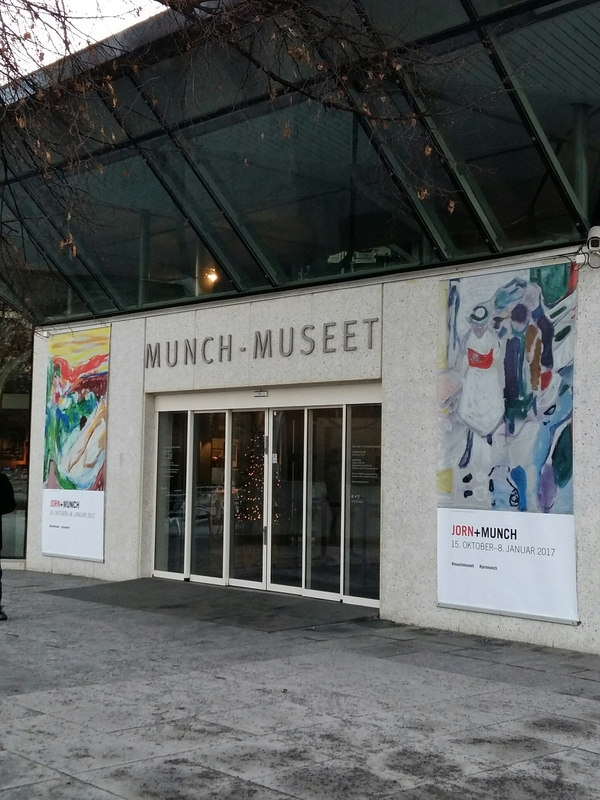 We arrived at the Munch Museum bright and early for its 10am opening time, hoping to see Munch’s famous painting The Scream. Unfortunately, having been stolen in 2004 and sadly damaged before its 2006 return it wasn’t on show, rather disappointing given every poster bore it’s unmistakable features. Nevertheless, an exhibition on Munch and his contemporary, Jorn, provided an interesting hour. The highlight for myself and Emily was the colour by numbers section of the exhibit; we had a competition on FB to decide the best one. Emily won. I’m not bitter. 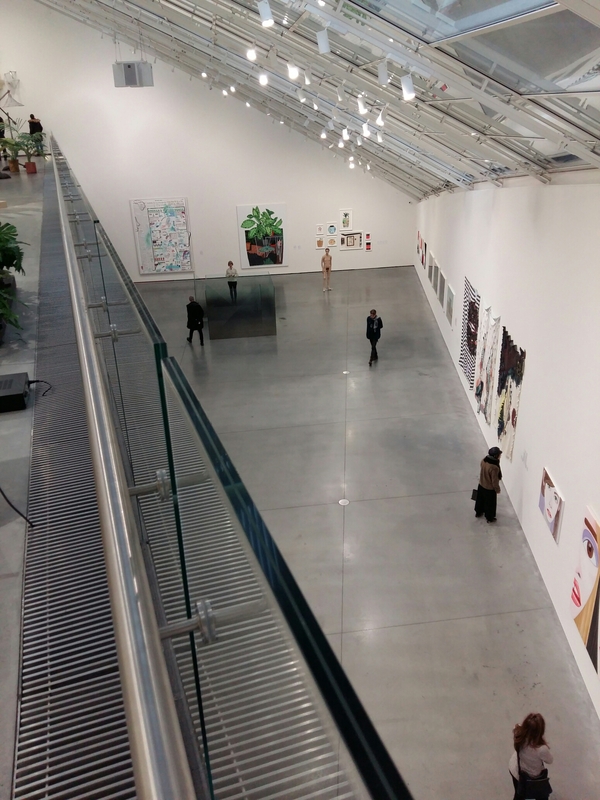 After the Munch Museum, Emily and I parted ways, she went to the Natural History Museum, whilst I headed to the Astrup Fearnley Modern Art Gallery, which focused on both art and Architecture. The building itself is a beautiful work of architecture, divided into two halves, one containing the permanent collection, the other housing temporary exhibits. The temporary exhibition “Los Angeles – A Fiction” was by far my favorite, featuring many American artists including Alexis Smith, David Hockney and Charles Ray. The permanent collection was much larger, with a wider range of mediums, however I found it rather bland. Bisected baby cows in preservative, and crucified sheep are not art. They are simply cruel, hideous and unnecessary. The highlight of this half was a 10ft high bookshelf sporting large grey lead books, by artist Anselm Kiefer. After my brief trip to the modern era it was time to go back to ancient times and visit the castle or Akershus Fortress. 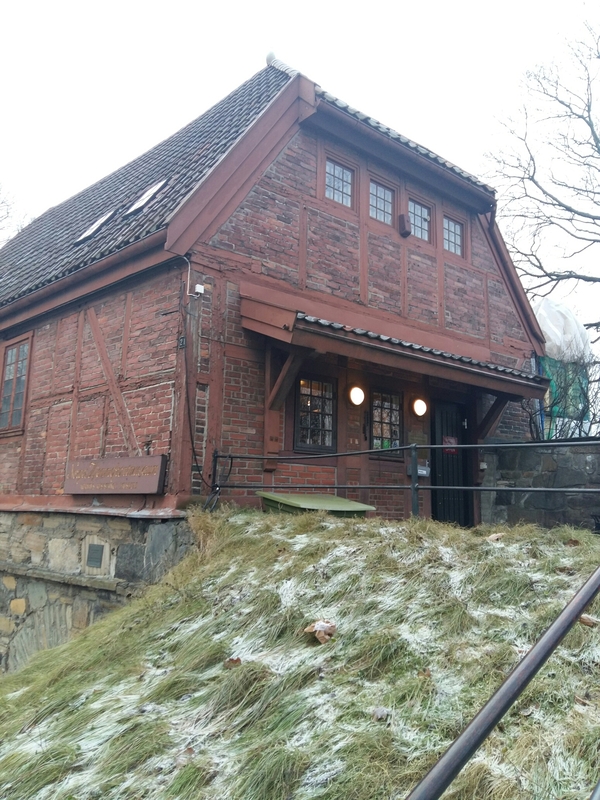 Within the fortress walls also lies the Resistance Museum which catalogs the struggles of the Norwegian Resistance throughout the 2nd world war, through continued fighting, underground publications and refusal to fight. Whilst not the largest museum, and mostly in Norwegian (although there is a good guide English guide book) it tells the stories through the medium of models. A s with all or Norway, it seems, the castle itself was closed for the winter. Ordinarily the interior of the castle, as well as the Mausoleum and Chapel are open to the public, however when we went only the visitors center was available. The visitors center itself was essentially a museum, with 2 rooms focusing on the history of the castle and relations between Norway-Denmark and its battles with surrounding countries, and another room on the castle’s previous function as a prison. Still an active government / military base, visitors can watch the changing of the guard, raising and lowering of the flag at sunrise and sunset (about 3pm in December), as well as enjoy a beautiful walk around the castle grounds. Our final stop was an evening visit to the Film Museum, housed on the ground floor of a large cinema complex. With late opening hours, and free entry, we tacked it on to our itinerary. The museum is small, and whilst an English information sheet is provided, it rarely matched up to the pieces on show. It’s a quaint museum fairly close to the castle, so a good one to visit if you find yourself nearby with half an hour to kill. After another dinner at Hard Rock Cafe (yes it’s the only place that serves vegetarian food) we were back at the hostel to read and relax (and enjoy the US netflix options Norway gets) it was sleep time again! Day 1 of our Christmas holiday, and we’d just landed in Norway! After an hour delay at Stansted it was more early afternoon than late morning! 1st things first, getting into central Oslo from the Airport. There are 2 routes, either by tube or an express route. The express route, run by flytoget, takes you straight to Oslo Central, but costs about £20 return. The metro also runs, it takes longer, but I believe it’s cheaper. We were told to buy flytoget tickets, not knowing any better, and proceeded to take the metro. Don’t do it, your tickets aren’t valid, and the conductor may give you a talking to when he inspects them. It’s fine, I think the Norwegians don’t think the British are the brightest, it’s fairly easy to play the dumb tourist card. As soon as we stepped out of the heated airport and onto the train platform the cold biting air was upon us. Sub-zero temperatures needled at us until we donned our scarves, hats and gloves, much to the amusement of the surrounding locals as they stood remarking as to the ‘mild temperature’ of the day. Norwegian winter days are rather short; The sun rises at about 11am, and sets by 4pm, although I’m not sure if you can call it sunrise or sunset, we didn’t see the sun once over the trip, just slightly different shades and brightness of grey sky. By the time we wandered to the hostel and left our bags, it was firmly night time, at about 5pm. Too late to visit any museums, we decided to walk through the city center and up to the palace, via some dinner. Norway truly do get into the Holiday Spirit! Every street was lit up with beautiful lights, Christmas trees were abundant, and trams chundered past with fairy lights draped elegantly from the roof. The Christmas market with Ferris Wheel and Ice Rink was packed with tourists and locals, searching for a last minute Christmas gift. Unfortunately, by our final day in the city the market had been dismantled, following the horrific terrorist attack at a similar market in Berlin. After a long day of travelling we were looking forward to our first meal in the capital. Neither myself nor Emily eat meat, which has never been an issue travelling before. Unfortunately, this was going to prove to be rather an issue. After pottering round for some time, searching for options we found the Norwegian answer to Pizza Hut. £26 for a medium pizza was not to be. Vegetarianism does not seem to be a thing in Norway. Precious few restaurants have a veggie equivalent, and virtually none affordably. McDonald’s, our last resort, had even removed their Veggie Deluxe from the menu, and Subway had a 200% price increase. Hard Rock Cafe, usually an expensive option, proved to be our saving grace! With affordable food, a whole page of vegetarian options and bottomless drinks, it was a jewel in Oslo’s crown! A 20 minute walk later, and we were tucked up in bed, exhausted from our 3am start and excited for our 1st full day of exploring. Who doesn’t love the Swinging Sixties? Great music, outrageous fashion, social reform and the constant threat of nuclear warfare! If I could have lived at any time, I’d probably have chosen the 60s; That or the 80s. Records and Rebels is a new exhibition running from September 2016 – February 2017 at the Victoria and Albert Museum in South Kensington. Housed in the temporary exhibition space, its an amazing set up, with plenty of content to keep you entertained for hours! Upon entering you’re handed an audio guide and some very good quality headphones. There’s no need to search for headphone signs around the exhibition, or fumble with badly-calibrated touch screens, this audio guide knows your location, and adjusts its track accordingly. It is a truly genius system. Walking through a succession of 8 rooms you find yourselves immersed in the art, fashion, literature, media and of course music of the age. The 60s were a huge time for political and social change, and this was reflected throughout the exhibition, with each room focusing on one or two topics. From feminism, mini-skirts, LSD, police violence, the Vietnam war and the Beatles you gain a comprehensive understanding of what it was to be alive in the late 60s. My favourite room was a celebration of the 1969 Woodstock Festival. 3 sides of the room are covered in 10 foot high, 30 foot wide screens showing intimate footage of Jim Hendrix famous set, closing Woodstock. Guests are invited to lie on bean bags on the floor and utterly immerse themselves in the sublime music. The exhibition would have taken us about 2 hours, had we been allowed to finish it. We were in the 1600 time slot, and we weren’t warned that the exhibition would take more than the 1hr45 we would have there. What we saw of the exhibition was fantastic, but unfortunately we didn’t have time to do the final 2 rooms, and when the announcement went up to tell us 30mins left, it knocked out the audioguides for about 15 minutes. At nearly £20 a ticket, it’s not exactly something we can pop back to finish, and by no means did we linger in each room. It’s such a shame, as it meant we left on a sour note. It would be worth the museum pointing out you may not finish the exhibition, if you go in past 1530. Despite the timing issue, this was a fantastic exhibition, which I would wholeheartedly recommend, although make sure you’re early enough! You Say You Want A Revolution? Records and Rebels 1966-1970 is on at the V&A until 26 February 2o17. Ticket prices are £17.60 or £13.50 for students. On a cold drizzly Sunday afternoon in York, when we’d exhausted all the coffee shops, and seen all the ‘must see’ tourist attractions we decided to check out an English Heritage site, just outside York. It definitely should have been higher on our priority list!! Hidden away, surrounded by blocks of flats lies the entrance to the York Cold War Bunker, only visitable by guided tour. As luck had it the next tour was in 5 minutes. Our tour guide, Anna, was clearly incredibly passionate about the Cold War, and her enthusiasm was infectious! We were the only two people on the tour, and she gave us plenty of scope and opportunity to ask questions as we went round. This Cold War Bunker was the operational HQ for the Yorkshire division of the Royal Observer Corps (ROC), a civilian branch of the RAF. Originally formed during WWII to identify enemy planes, the group was stood down at the end of the war, before being reformed during the Cold War to take readings of any nuclear bombs that fell. From the base they could take readings of radiation levels, try and identify where the bomb fell, and what size it was. 1st step on the tour was to watch a short video highlighting some of the history of the Cold War, and the provisions the British Government had in the eventuality the war went nuclear. Having visited a couple of Cold War bunkers in Berlin earlier this year, the difference was stark. The German Government made civilian bunkers, and promised the people they all had a place to go. In fact their bunkers could only hold about 1% of the population, and some took a week to be prepared and made operational. The British Government had a different idea. They showed people how to make their own bunkers at home, to stock with them with food, paint windows white and reinforce them with sandbags. With the ever increasing strength of nuclear bombs being developed these ‘bunkers’ or safe rooms would have been just as futile. The York Cold War bunker could keep 60 people alive for up to 30 days. Over the course of the 30 days all the inhabitants would work in 3 groups of 20 on an 8 hour rota. 20 people would be working in the operations rooms, 20 people would be in the canteen relaxing, and 20 people would be sleeping in the dorms on a delightful ‘hot bed’ system. When 30 days was over they would all have to leave the bunker and go into what was left of the world above them. Thankfully the bunker was never needed during the war, although the ROS often ran 48 hour training weekends. So many volunteers couldn’t stand the sleeping conditions even for this fraction of time, and went without sleep, instead of braving the bunk-beds. The photo left shows some of the personal effects of an ROS member on one of the thin beds. No reminders of home, family or friends were permitted in the bunker, as the government feared it would cause psychological damage, not knowing whether friends or family were alive. Those posted in the operations room would have a busy 8 hours ahead. They had to collate all the data gathered from other ROC groups around Yorkshire, and combine it with their own data. The equipment pictured right was used by all branches of the ROC. The long cylindrical piece of equipment hanging from the ceiling was a form of gieger counter which would measure radiation levels below ground. The white cylindrical box was installed on the roof of the bunker, and was used to identify the location of the bomb. Holes had been drilled into the metal container, which housed photosensitive paper. When a bomb dropped, the initial brilliant flash of light would be registered by a dark dot forming on the gridded paper. The data from all the boxes across Yorkshire would be collated, and using a technique similar to triangulation, the location could be estimated using a map (pictured below). In order to collect the paper from the box , a member of the corps would have to venture outside the safety of the bunker. To ‘protect’ him from the deadly radiation the Government issued a cotton boiler suit, more as a psychological protection than a physical one. As the war progressed more sophisticated technology was developed in computing. A.W.D.R.E.Y. (right) essentially did the same job as the volunteers in terms of locating a bomb’s epicentre. She did have a couple of flaws, including thinking every episode of lightening, or firework was a nuclear bomb. For this reason volunteers continued to perform manual analysis of the data. Volunteers would collect information from other branches. Sitting in rows like this they would write all incoming data onto the screens, which could be flipped around, so those working below could analyse the information. Those working in the room below would work to collate information and locations of bombs over a wider area. Working on huge maps of the North of the UK they would also communicate their findings to other branches and the government. Cold War bunkers can be either bomb proof, or blast proof. Bomb proof shelters can withstand bombs falling directly onto them, or in the area closely surrounding them. Blast proof shelters can only withstand ‘near-misses’. Having been designed in 1955, before the mass up-scaling of nuclear bomb strength, the York bunker could only survive a ‘near-miss’ 8 miles away, from a small bomb. If anything fell closer the shelter would have been flattened, or incinerated. In the wake of recent political events (damn you Trump) the likelihood of a hot war seems to be ever increasing. Unfortunately this bunker would provide very little protection in the event of a nuclear bomb falling on Britain. The increasing payload of modern nuclear bombs makes survival chance much smaller, and if the bunker wasn’t flattened the vital equipment needed to sustain life has probably been decommissioned now. The air-conditioning unit contains materials now banned by the EU, batteries no longer work, and air filtration systems have never been tested. If the government does find itself in a situation where nuclear bunkers become necessary, chances are they’ll just make new ones. That seems to be the 21st century way! When English Heritage decided to save York Cold War Bunker, they found it in a state of disrepair. The sewage outflow pump had been turned off, and so was no longer pushing water out. Without the positive pressure, water started flowing back in, leaving the bunker flooded, and the task of restoring it that much harder. Just over a decade ago the bunker opened its doors to the public. Over the past ten years many members of the ROC stationed there have returned and shared their memories of the bunker. Many found love there, some found new extra-marital love there, and one volunteer even went into labour! The bunker is open by guided tour to the public every weekend, and can be visited during the week for schools or groups. Entry is free for English Heritage members and costs £7.00/£6.30 for adults or £4.20 for children. The price includes an hour long tour, and there are 6 tours a day. This was one of the best English Heritage sites I’ve visited so far, and I’d highly recommend it! Our tour guide, Anna, brought the whole place to life and was clearly incredibly knowledgeable and passionate about both the bunker and the Cold War, she really made the trip! Thank you Anna! !